Now we don't normally give mods a separate post here on Equestria Gaming, but this is somewhat of an exception. After all, who doesn't want to fling chubby little ponies at equally chubby changeling queens in their wee fortresses? This mod lets you do just that, and only a simple Google Chrome/Firefox plugin is needed to play (sorry users of other browsers!). It is still a work in progress, but I'm sure that you'll enjoy it anyways. So hit up the link above and take a look at the mod, then perhaps give it a try, ok? 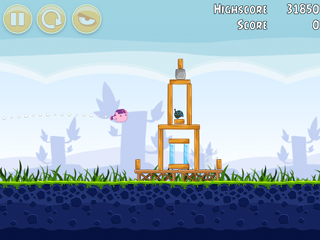 Also, this isn't the first fandom that has made an Angry Birds-type game. The Portal fandom also did it with Aperture Birds, which you can find at http://www.moddb.com/games/aperture-birds and is far better in my personal opinion.